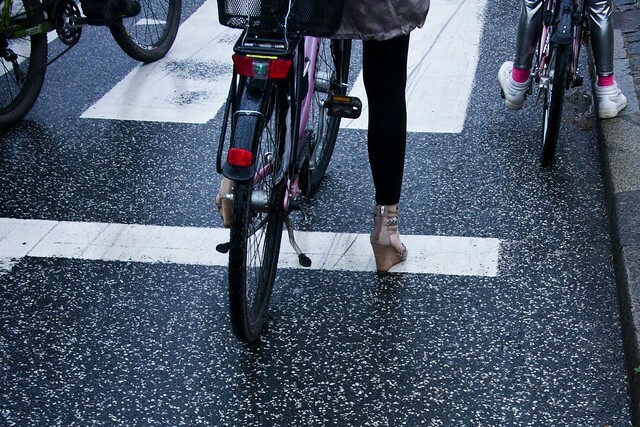 When you spend a few years staring at this thing called Bicycle Culture, you start to see the glorious, human details. 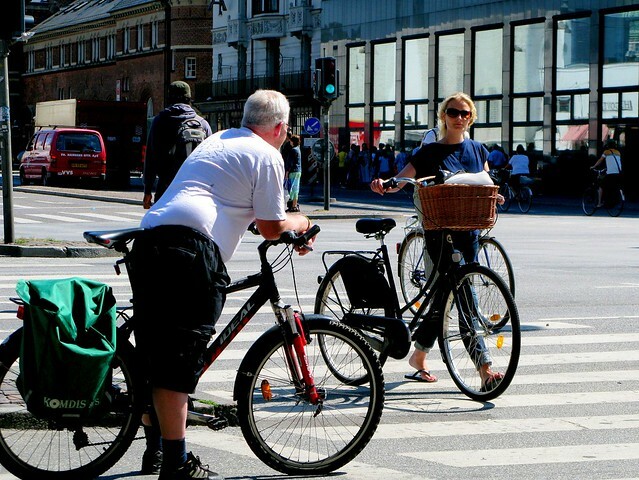 The bicycle is a fifth limb for Copenhageners and you would like to think that a few hundred thousand people on a few hundred thousand bicycles would present you with a massive variety of behaviour and anthropological details. 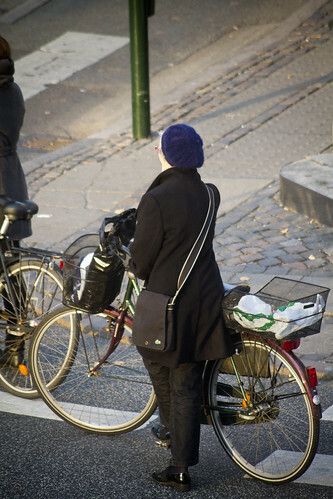 We started noticing posture on bicycles - in particular the way that Copenhageners wait for red lights. We started thinking... is there a pattern to it or was it completely random and individual? To our surprise, we learned that there are ten basic postures used for this situation. With variations, of course, but just ten basic postures. 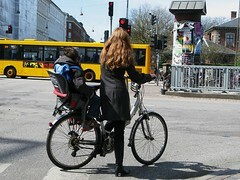 Waiting for red lights to change to green is an integral part of a daily cycling life in Copenhagen. 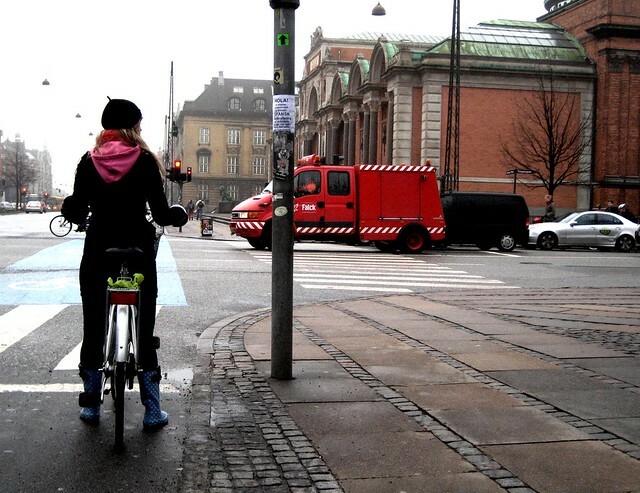 When you have well-designed bicycle infrastructure, regular citizens wait at red lights at every opportunity. So... welcome to the Red Light Posture Series. 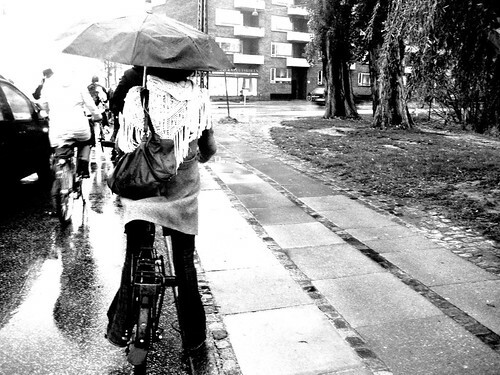 Off we go on a little anthropological journey into the bicycle culture of Copenhagen. 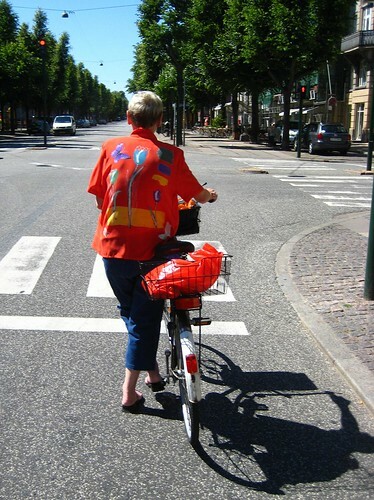 Ladies over a certain age - let's say about 50 - often get off their bike at red lights and stand next to it until the light changes. 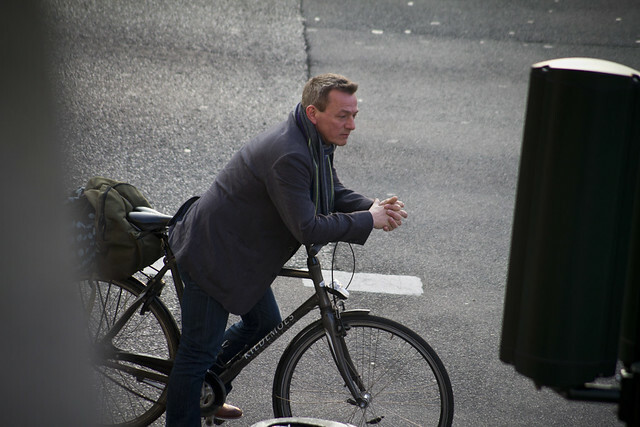 Usually with their outside foot resting gently on the pedal, but sometimes just standing next to the bicycle. 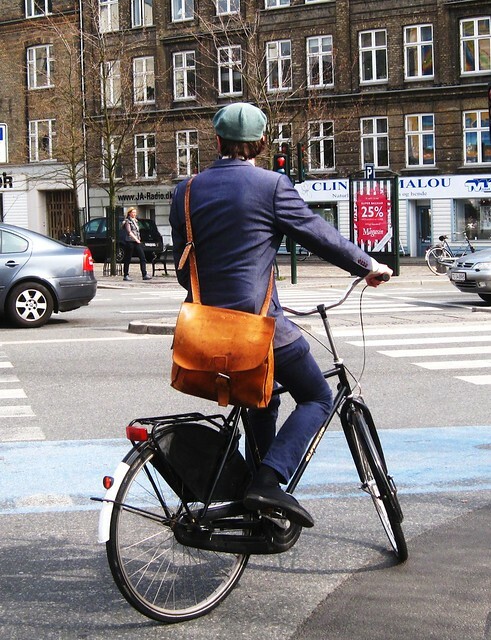 This was the acceptable way to do it back in the day- indeed for decades and decades - and it is so lovely to see it on the bike lanes. So relaxed. Perfect for The Slow Bicycle Movement, actually. 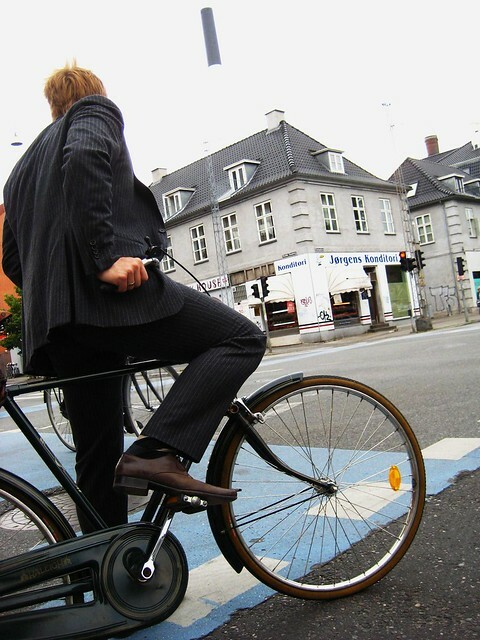 A classic stance for those who can't be bothered hopping off the saddle or those who prefer leaning to the left and therefore cannot enjoy the comfort of the raised curb. A sense of impatience and eagerness to continue on. Ballet on wheels. 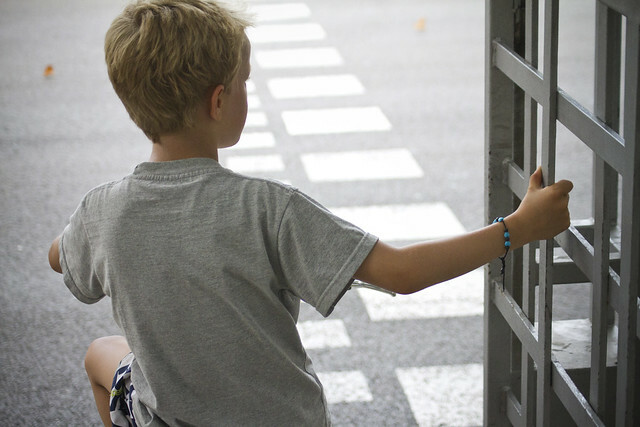 Although this posture also applies to situations that don't feature a red light, too. 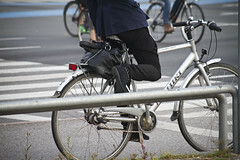 As well as to bicycle users using one of the cyclst railings in the city. Feet firmly on the ground, bum off the saddle. No hurry at all, just planted solidly at the stop line. Plenty of time to have a look around at your city. Which is kind of the point of living in a city. 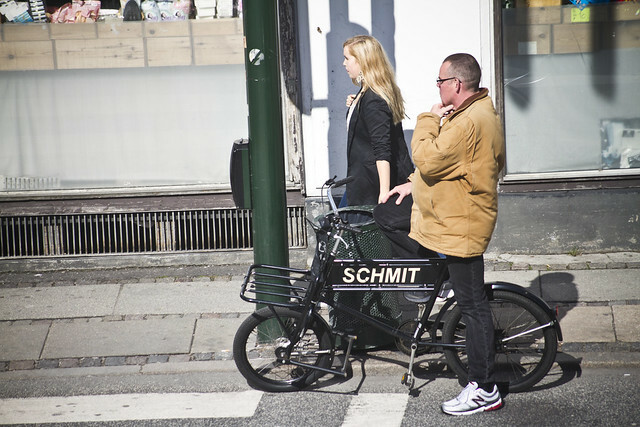 Classic Copenhagen. No tense muscles, just waiting calmly and quietly for the light to change. The city is ours. Let's use it as we like. 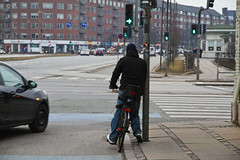 If you cycle around Copenhagen, notice how the metal is rubbed smooth on all the lightposts next to the cycle track at intersections. Rubbed smooth like Buddha's tummy. 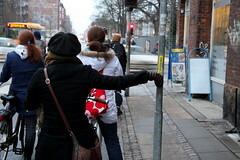 Copenhageners will lean wherever they can and with whatever part of their body is most convenient. It's such a popular posture that we have an entire set of photos dedicated to it. 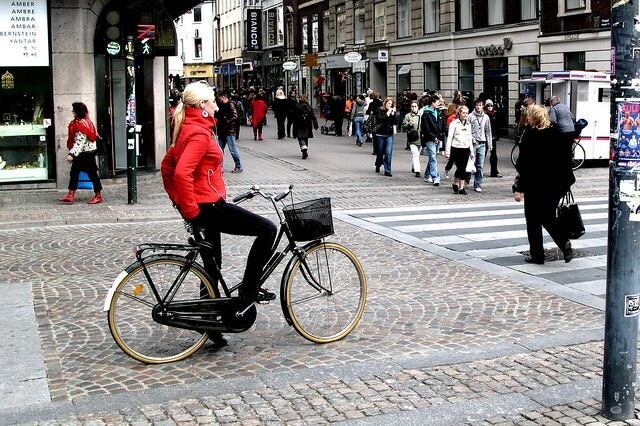 This is such a popular posture - and one that fascinates us - that we designed the Copenhagenize Love Handle to accommodate our fellow citizens. 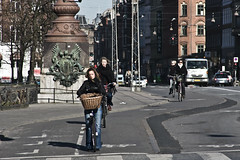 And the City of Copenhagen now has over 15 railings and footrests to accommodate this desire at certain intersections. Here's a mix of #5 and #6. Tough day at the office, perhaps. 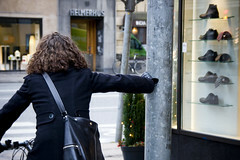 Of course, you're not limited to leaning on urban furniture. You can also lean on a fellow citizen. 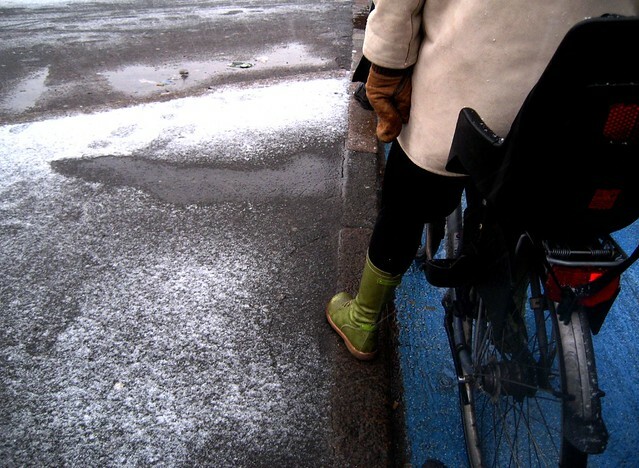 The curbs are valuable real estate on the cycle tracks. Like the lamposts for leaning, only a few get the chance to experience the convenience of the raised surface whilst waiting for the light to change. It's first come, first serve. How far you stop from the curb - and subsquently how far you have to stretch to reach the curb - varies not so much from person to person, but rather on your train of thought. If you plan for a curbstand, you stop closer to the curb. Sometimes, however, it may be an afterthought and you decide upon it at the last minute. You're relaxed but you have one foot in position. There's no stress, but you're as ready as you'll ever be for the changing of the light. Sometimes both hands on the handlebars, sometimes one. Sometimes none. Here we have #7 combined with #6. This posture requires a launch to get into motion. With the foot on the highest pedal, it requires less effort, of course. Although that depends on how much momentum you wish to get going. There is the opposite variation of this posture. Resting one foot on the pedal that isn't ready for pushing down. This posture involves more of a launch before momentum is achieved. Interestingly, this is most typically a posture favoured by the male of the species for some reason. It's often combined with one of the other postures. Above is a combo with #7. It's probably the most relaxed posture of them all. Here it's combined with #3. Here it's combined with #7 and with the added twist of leaning on the knee, as opposed to the handlebars. 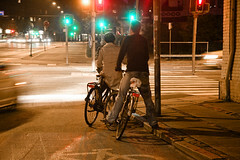 Like with most of the postures a red light is not always required. Sometimes you just need to pull off the cycle track to stop and enjoy the last minutes of crisp, winter sunlight. The Extreme Lean is usually in combo with one of the other postures (#7 above) but it has such a unique nature that it deserves a category of it's own. 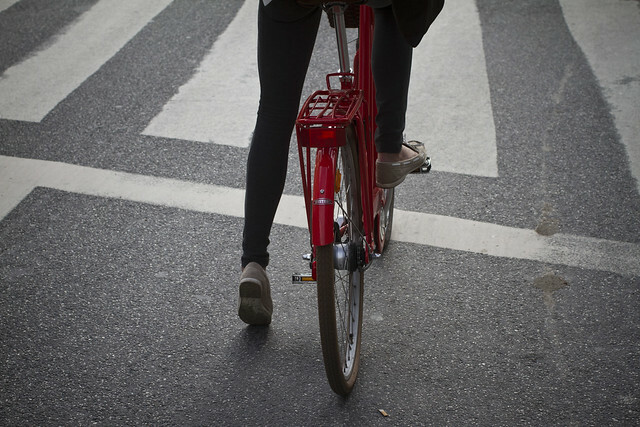 Most people will stop at a red light and the bicycle will remain, by and large, upright, regardless of the posture. Then you have the extreme leaners. Left or right appears to be an individual thing, but leaning far off to the side is the common denominator. 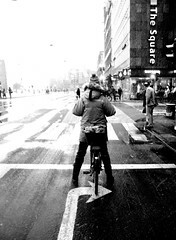 The leaners will usually employ the same technique from one traffic light to the next. It's not an afterthought like the over-stretched curbstand but rather a repeated pattern. 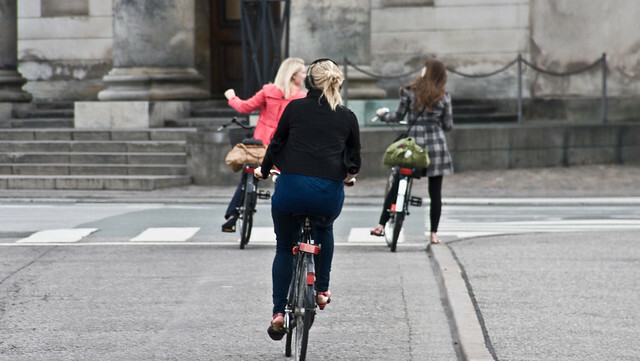 In this photo, the bicycle user on the right nabbed the curb. One may assume that the friend on the left is leaning closer to continue their conversation. At the next three lights, however, they both did the same thing without curbs. Once an extreme leaner has established their behaviour, they are not influenced by others. They'll stick to their left or right inclinations. 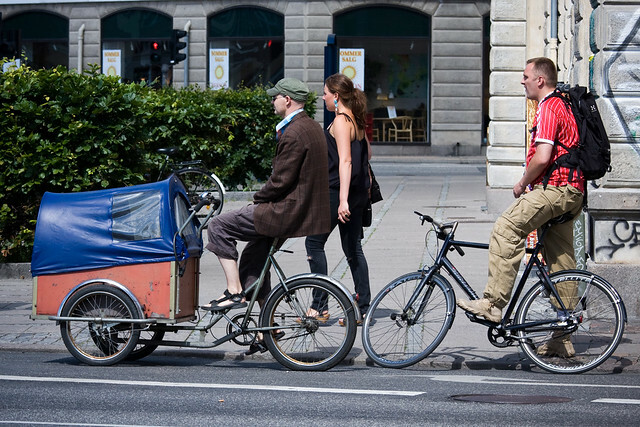 This posture is unique to Copenhagen, given the fact that there are 40,000 cargo bikes in the city. 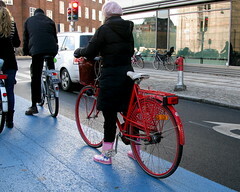 Cargo bikes have integrated red light waiting positions in their design. It is the cargo bike version of #4. 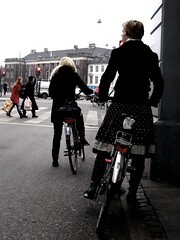 One or both hands off the handlebars and straighten your back. Very little effort required. Glance about the urban theatre while you wait. 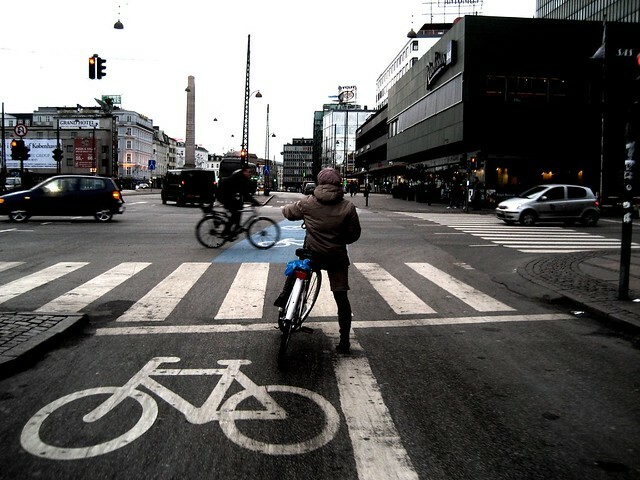 You see the trackstand on occasion in Copenhagen, like the gentleman above who performed it in style and at length. It's not really a posture, but rather more of a way of avoiding stopping. 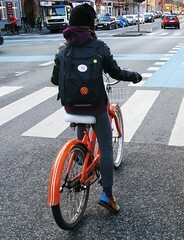 Now that fixies are so completely out of fashion - and have been for a couple of years - you see less of them. 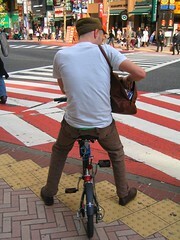 It's often bike messengers who attempt the trackstand. More often and not it ends in one of the above ten postures. Who waits at red lights? lol Actually I use the right foot on the curb method or leaning left or right. Generally I lean left. 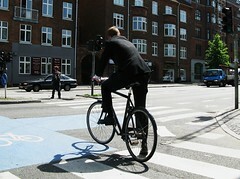 I know it doesn't follow your slow bike movement but I wish I was good enough to do a track stand at red lights. That looks so cool! It depends on how short my skirt is. 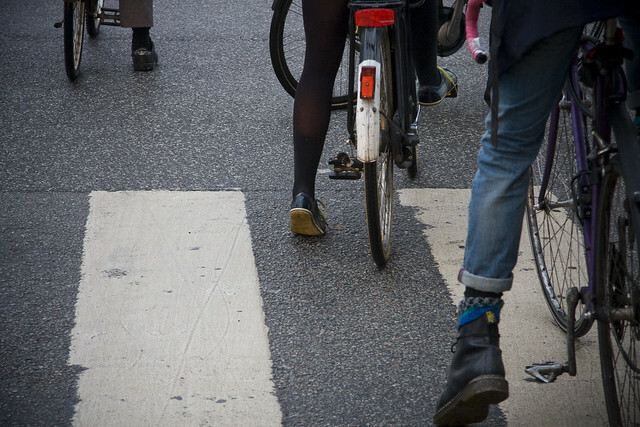 If I'm wearing a shorter skirt, and I notice that the drivers on the cross street are struggling hard to get a glimpse, I'll hop off and plant my two feet. Otherwise, I usually lean to the right or put my foot on the curb if one is nearby. I didn't see the Rocking Straddle. Its a mix of the Copenhagen Straddle and a Relax and Lean. 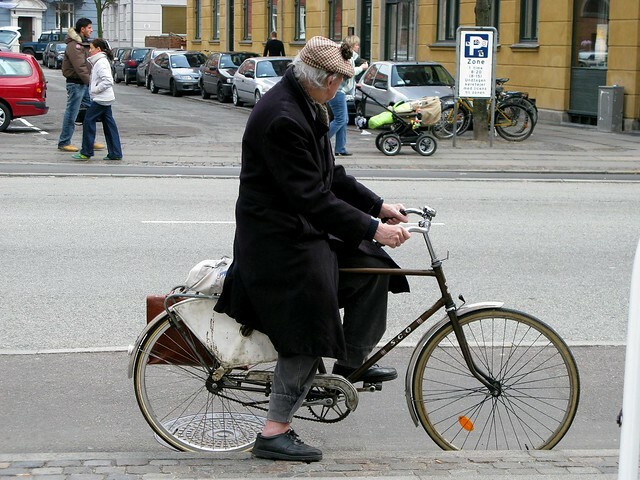 Straddle, grip the back brake firmly, lean back, and relax in a bicycle-rocking-chair. oooo .... stepping off the bike and standing to the side is rather elegant, don't you think? you know so much about people on normal bikes! !even their politicians preferences, maybe? this blog is a sociology experience! 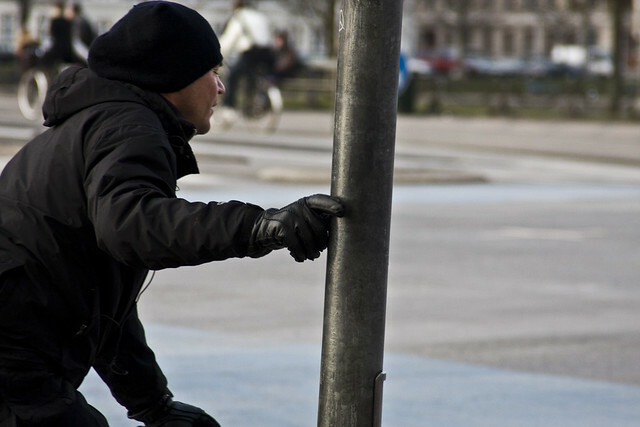 None of you mentioned the Light Pole Grip.. Keeping your balance by holding on to a light pole with one hand? I do that quite often myself. I agree, Raquel, in some way it is a kind of sociological experiment! 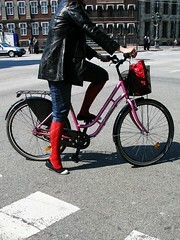 i dig the pic with the girl who has red stockings and a matching purse! Great for dialing in your balance, and more calming and meditative than it might seem. 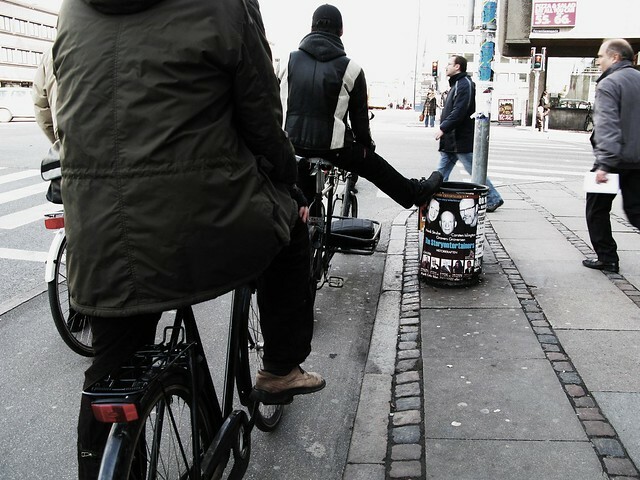 Does anyone ride fixed gear out there in Copenhagen? 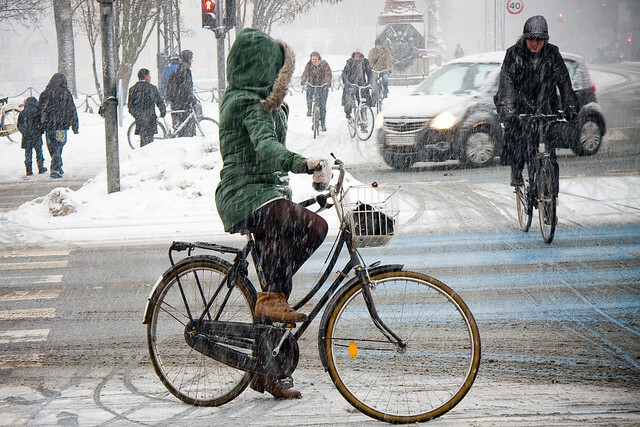 Riding fixed can fit within the "slow bike movement." We're not always briskly spinning along. I very much enjoy cruising at a slow pace and do it daily. What a delicious post!! There's something so appealing and delightful about this series of photos. Thanks so much for posting them all in the same place like this. I can think of a sad reason why some women over 50 dismount at red lights as my nearly 60 year old mother suffers from it - hip arthritis. 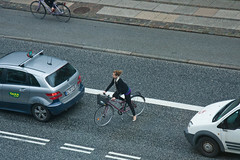 noone performs track stands in CPH? Brilliant, had a few little chuckles when reading this! 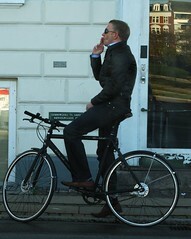 Although you did miss the fixie "balance"
Te he - very nice! I often see the lycra clad racers sitting perched on their top bar at the lights - looks so awkward and uncomfy compared to all these lovely laid back people relaxing at the lights.